Gandona is rooted in tradition and a passion for transforming land into something extraordinary. It’s born from an estate that rests upon a sloping hillside high above the beauty of Napa Valley and Lake Hennessey – its vineyards, carved from the steep terrain and planted in four blocks, each possess their own distinct personality. Pritchard Hill, located in the Vaca Mountains between Lake Hennessey and the Atlas Peak AVA, is made of compacted volcanic rock that rises up to 1,800 feet. Gandona Estate vines range from 900 to 1,100 feet in elevation. The iron-red and yellow-tinged soils are shallow, well-drained and very rocky. 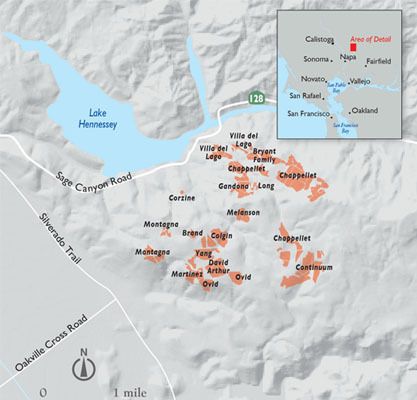 Three distinct soil varieties are found on Pritchard Hill; Hambright soils in the southerly vineyards, Henneke, which is limited to slopes along the southwestern shore of Lake Hennessey and Sobrante soils found in the more northerly vineyards including Gandona Estate. The soil composition on the estate itself is intensely fragmented and Gandona Estate’s four vineyards are made up of several soil types, producing grapes with an array of flavors. The foundation for Gandona vineyards is Sobrante Loam so thin that it barely covers the rock underneath. Sobrante soils were formed in material weathered from basic igneous and metamorphic rocks, are found on foothills and have slopes of 2 to 75 percent. Pritchard Hill sits above the valley floor’s fog, soaking up early morning sun and experiencing more moderate temperatures with less diurnal variation. The cooling effect of Lake Hennessey aids in the development of aromatics and in even ripening, and warmer nights extend the daily growing period into the evening hours. The altitude also protects Pritchard Hill from spring frosts and allows southern breezes to moderate the temperature year-round. Due to the topography, when it gets hot on Pritchard Hill, it doesn’t stay hot long. Many people are surprised by the quality of Cabernet Sauvignon that Gandona Estate was able to produce in 2011, a rain-battered vintage that plagued many areas of the valley. The quality seen on Pritchard Hill in 2011 can be largely attributed to altitude and topography – Pritchard Hill ripens earlier than most other high-elevation sites in the valley, a huge benefit in cool or wet vintages. Gandona Estate is situated on the northwest slope of Pritchard Hill and according to winemaker Philippe Melka, “different exposures [on Pritchard Hill] produce dramatically different wines despite similar soils”.